*All are welcome. No registration is required. My research project expands upon the literary-cultural periodization of ‘late modernism’ by focusing on the watershed moment of World War II and its immediate aftermath. It shows how wartime literature stands uneasily within a continuum of literary developments in mid-twentieth century Britain: looking backward and forward at the same time, works variously drew from, as well as adapted, modernist strategies to shape a new kind of art. With close reference to a range of texts, as well as films, photographs, and paintings, I argue that spatial and temporal dislocation were defining characteristics of artistic response to the urban bombing campaigns. In addition, I scrutinize why the psychological apprehension of time and urban space manifest themselves in issues of space and time in narrative; why the lexicon of dread, memory, and futurity underlie experimental prose of the day; why distorted temporalities and temporal containment serve as overarching metaphors for Blitz writing; and why the literary-cultural history and memory of the Blitz are constructions of a specific process of narrative understanding: what Peter Brooks calls the anticipation of retrospection. 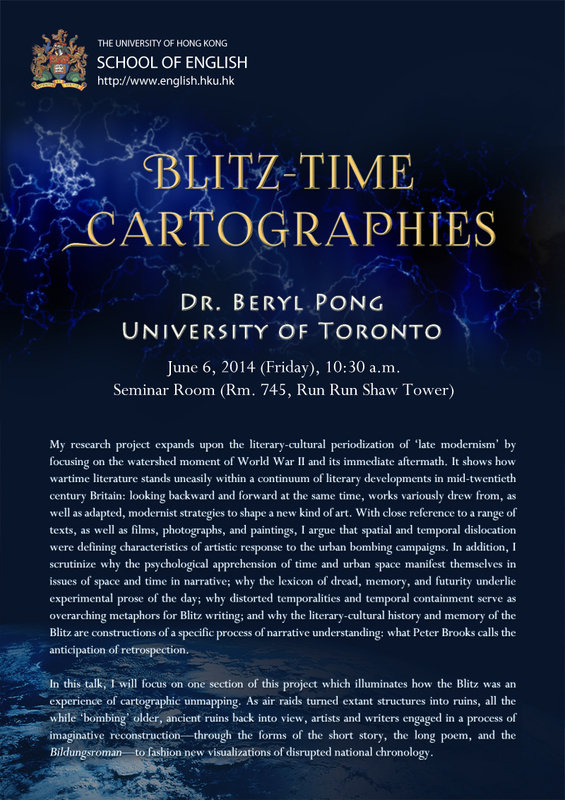 In this talk, I will focus on one section of this project which illuminates how the Blitz was an experience of cartographic unmapping. As air raids turned extant structures into ruins, all the while ‘bombing’ older, ancient ruins back into view, artists and writers engaged in a process of imaginative reconstruction—through the forms of the short story, the long poem, and the Bildungsroman—to fashion new visualizations of disrupted national chronology.